“Black Life/White Light” is an exhibition featuring White artists responding to the Black Lives Matter Movement. This all-media, national show will survey the ways White artists have engaged and supported the fight to preserve and protect Black Lives. Artists are asked to submit previously un-exhibited work created after 2012. Works selected by Curator Sheldon Scott and Assistant Curator Deirdre Darden will be exhibited at ReCreative Spaces Gallery in Northeast Washington, DC. Submissions for review will be accepted from February 1st till February 22nd, 2015. Please email samples (blwlcall[at]gmail[dot]com) of works (5 Max), a brief bio, and statement and or image of the piece you would like to submit for placement in the show. ReCreative Spaces, in partnership with The Menkiti Group, is creating a place for communities to gather and share their passion for art of all kinds. Currently located at 1613 Rhode Island Ave NE, we offer monthly gallery shows, weekly classes, performances, and private rehearsal and event rentals. “Belle” is a beautiful film to watch. I was thrilled that director Amma Asante made a guest appearance at the movie theater for a Q&A following a showing of “Belle” on Mother’s Day. Since my mother had been asking me for months when the film was coming to theaters, I couldn’t think of a better gift. Ms. Asante offered up some information: she is a huge fan of Jane Austen, she carries duel identities as a Brit and a woman of color (of Ghanaian parentage); she loves period drama; and “Belle” was made for $10 million. I would’ve guessed no less than $25 (on a shoe string). “Belle” is a testament to the many stories yet to be told through the ages, in the English language, featuring women of color. Compared to American production budgets, there had to be a substantial amount of commitment to this story from actors including Miranda Richardson, Penelope Wilton, Emily Watson, Tom Wilkinson, among others. A film stacked with a cast like this confirms that “Belle” is an important film. What we now know is the “Belle” story begins long before there was any treatment or script for a film. Dido Elizabeth Belle was born in 1763, the daughter of Maria Belle, an African slave and a white British naval officer, Sir John Lindsay. Lindsay sent his four-year-old daughter Dido to England to be raised by his uncle William Murray, Earl of Mansfield and Lord Chief Justice who would preside over two of the most important cases in the history of the abolition of slavery in Britain: the Somersett case of 1772 and the Zong case of 1782. This article in The Guardian UK distinguishes the movie story from the real life story – and still gives a thumbs up for the film. My assumption is Dido is a trigger for a story that tells us money can’t buy everything especially when its a matter of race and gender. Misan Sagay saw the “Portrait of Lady Elizabeth Murray, circa 1778” as it was labeled while a student at the University of St. Andrews in Scotland in the 1990s. Sagay (Anglo Nigerian) was intrigued by the painting especially because of the young biracial nameless woman on the left of Lady Elizabeth. Fast forward to 2009 when Amma Asante receives a script and a postcard of the painting from Sagay. Asante is instantly drawn to the image. The journey to “Belle” reminds me of an assignment I had in 4th grade. Our teacher, Miss Cole, took us to the National Gallery of Art in Washington, DC. We visited the paintings from the Renaissance to Impressionism. Our assignment was to write a story about a painting – not the true story, but the story the painting inspired. I chose a painting by the 19th century impressionist Pierre-Auguste Renoir: “A Girl with the Watering Can.” But I also liked his “A Girl With a Hoop.” BTW Pierre-Auguste Renoir was the father of filmmaker Jean Renoir. Around the time of the 18th century, we really were — people of color were — an accessory in a painting. We were there rather like a pet to express the status of the main person in the painting, who was always white. And for anybody who’s lucky enough to see the painting, what you see is something very, very different. 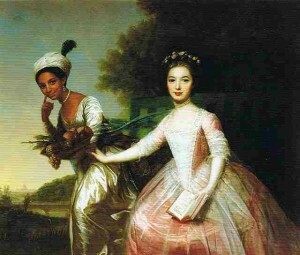 You see a biracial girl, a woman of color, who’s painted slightly higher in the painting, depicted slightly higher than her white counterpart. She’s staring directly out at the painter, you know, with a very direct, confident eye. … So this painting flipped tradition and everything that the 18th century told us about portraiture. Art is essential in telling Belle’s story. As much as it’s a story about our favorite “Austenisms” of wealth, class and love, it is also about race, slavery and abolitionism. Asante says she deliberately held back the release date to avoid being boxed in with “12 Years a Slave” (winner of the Academy Award for Best Picture in 2013). She also deliberately did not show the African slaves who were sent to their watery deaths for the insurance – their story being a moment of awareness for the main character and conflict between her uncle and the man she loves. Asante assures us, the image of human slaves on screen would’ve shifted the film away from its title character and Asante’s vision. A picture speaks a thousand words. I surrounded Belle with the funny, witty, wise women I love and write. Yet we never make light of Belle’s social isolation. Like my 4th grade assignment, screenwriter Misan Sagay saw a painting by Johann Zoffany of Dido Elizabeth Belle and her cousin Elizabeth Murray. She saw a story. Asante saw it too. Unlike my Renoirs, Zoffany’s painting is intended to be a portrait, a record, of two lives and two girls who were special to the person who commissioned the work. Had I seen this portrait in the National Gallery of Art and based on the stories I was told about black/white relations of the time, I would’ve assumed, as Asante pointed out in her post-film chat, “the black girl is the white girl’s servant.” I didn’t want to write that story. Actually, there are stories in my own family’s narrative that flip the black/white/biracial/multiracial tradition and everything we were taught in our school history classes. 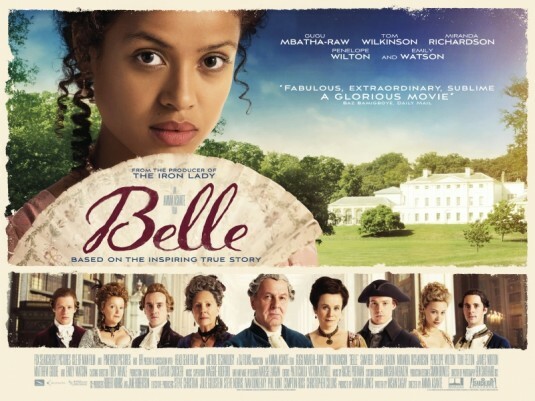 Belle is portrayed by Gugu Mbatha-Raw, a relatively newcomer to the scene and I can assume to period drama as well. 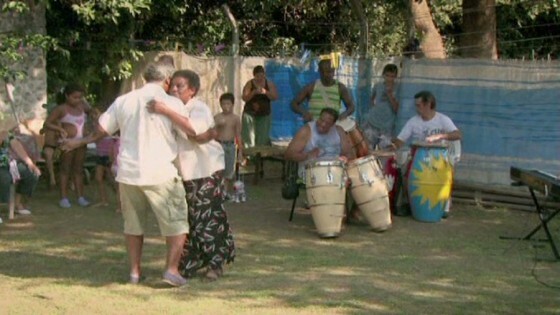 (Mbatha-Raw does appear in the 2008 Romantic comedy mini-series “Lost in Austen” about a present-day Jane Austen fan that swaps places with Elizabeth Bennett.) How many opportunities are available to an actor to portray a free aristocratic biracial woman in the 18th century, and the title role at that? This would pose a challenge for both Mbatha-Raw and Asante to make her and the audience believe when there is only one reference of that status and story – the portrait that inspired the filmmaker. And Dido is not Jane or Elizabeth Bennett, Elinor or Marianne Dashwood in hue or status. Even with her fortune, Dido can’t claim the social status of Mr. Darcy’s sister Georgiana or his intended sickly cousin Anne De Bourgh. Dido is under a different kind of scrutiny. She can’t be seen and heard at table by the company her family keeps. Her very appearance is unappetizing to society. But the money helps. And her uncle and aunts maneuver these social obstacles to the best of their abilities, sensibilities, and intentions – though not always with success. In the final analysis society makes Dido fully aware that she is “not one of us.” She isn’t even “one of her own.” But she finds her way home to her mother in a very tender scene where a free black servant combs her hair in the way hair of her texture should be combed. This for me, this intimate scene was one of the most definitive moments of Dido’s story. Last year I made a special trip to Baltimore to see an exhibit “Revealing the African Presence in Renaissance Europe” at the Walters Art Museum. I was anxious to see this exhibit. For all the period drama I loved and watched over many years that included adaptions of the novels of Alexandre Dumas — whose grandmother, Marie Cesette Dumas was a slave in Haiti and of African decent — it was important to see where did someone who kinda or looked like me and persons in my family fit into the dominant Eurocentric narrative and genre. And not just the slavery and servitude narrative. Misan Sagay and Alma Asante must’ve had similar yearnings; as did Dido. And I’m happy to say yes, there is “Belle” and there are more paintings to see, and stories to tell. Ask the ghosts of U.S. history who physically built this country: Black slave labor. While some question the timing and frequency of films and other media thematically focused on slavery in the United States, the stories and the attention given to “12 Years a Slave” and tonight’s premiere of the PBS documentary mini-series “African Americans: Many Rivers to Cross” hosted by Harvard professor Henry Louis “Skip” Gates (who was also the historical consultant for the previous film), may be paving the way for making the case for reparations. “12 Years a Slave,” to director Steve McQueen’s credit, gets into slavery’s head and the psychological, physical, spiritual and emotional damage it inflicts on enslaved peoples. A free Black man named Solomon Northrup (Chiwetel Ejiofor) is kidnapped and literally sold “down the river” into slavery. 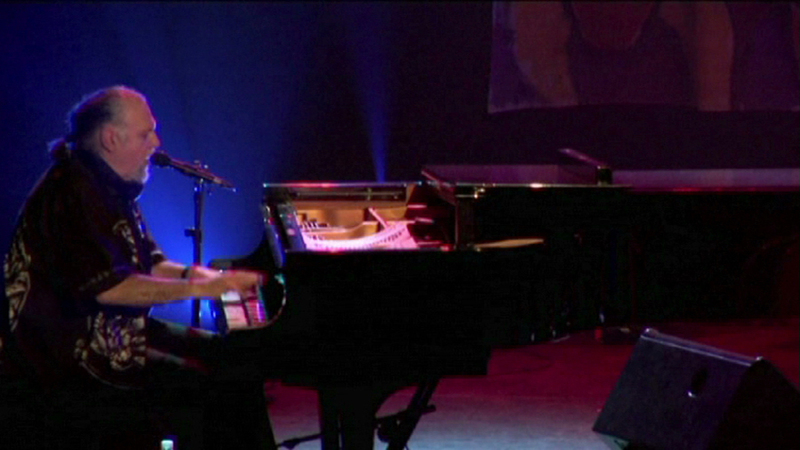 At a preview of his PBS mini-series, Skip Gates said “I would’ve failed slavery.” Would he? Solomon knew what it was to be free; that knowledge kept slavery from getting inside his head and crushing his identity. The film’s narrative follows Solomon like “a day in the life” of his fight to keep his core identity in tact in a world that benefits from breaking spirits and all remnants of human being-ness and dignity with the whip and God. Reactions of audiences of all races who’ve seen the film range from “damn shame” head shaking, anger, poignant silence, to out right sobs during the credit roll. I wonder why I coudln’t get more excited this year about the 150th Anniversary of the Emancipation Proclamation. It was a great thing. Or perhaps I’ve come to the thinking, Emancipation isn’t enough especially when it doesn’t even include an apology for slavery’s “crimes against humanity.” What guarantees did freedom bring without resources and the protection of the law to repair the damage, prevent further abuse, and allow for people to build a life? At this moment 14 Caribbean nations are seeking an apology and reparations from Britain, France, and the Netherlands for lasting damage of slavery on their people and their country from the former colonial rulers. The fact that this is being reported in the New York Times and not on “alternative” internet publications reposted on Facebook, may signal the impact of “12 Years a Slave.” But the New York Times doesn’t raise hopes for compensation — do they dare? (Who knows what you’ll find when you follow the money) Reparation compensations were reserved for slave owners not their former slaves from which they got generations of free labor. And courts will make the case that one cannot dispute a slave law that was legal in its time. A form of amnesty. In its time when owning a human being is legal, how the owner treats its human “property” weighs more on the conscience in these films, than seeing or describing the actual physical labor exploited by white slave owners and overseers. It’s no accident that in this clip featuring Skip Gates with Edward Ball, author of “Slaves in the Family” you get some actual accounting (read numbers) of how a white man in America can prosper from black slave labor. Slavery got into Edward Ball’s head, and in our time maybe more. NOTE: By the way, to PBS’s credit, “American Playhouse,” the American drama series featured “Solomon Northup’s Odyssey” starring Avery Brooks as Solomon Northrup. The television film was produced in 1984 and directed by Gordon Parks. “American Playhouse” was ahead of its time for television drama that raised the bar on the “movie-of-the-week format” But timing seems to be everything.